Learning about history can be fun, as Yared unexpectedly discovers. He is unhappy when his parents leave him at his Nanna’s house while they take a holiday to sort out problems in their marriage. Although he tries to fit in with his Nanna’s brisk requests and strict routines he is unsettled and fearful of what might happen if his parents decide to separate.To make matters worse, he has a relief teacher who focuses unwanted attention on him when she asks about his ancestors as the class is studying family history. When he asserts that he is Australian although he was born in Ethiopia and adopted by Australian parents, she says that he isn’t. That afternoon when Yared finds a box of old coins on his nanna’s dressing table, he thinks that he has found a treasure. It is a treasure, but not the kind that he expects. 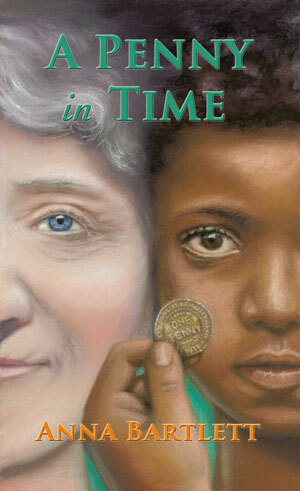 The 1911 penny that catches his eye becomes the focus of a nightly story told by his nanna. The stories surrounding the different owners of the penny span Australian history from Federation through to the 70s. The tales not only bring Yared and his grandmother closer but they also give Yared a feeling of belonging when his grandmother entrusts the penny to him. He knows that other children have held the same penny and ‘lost it, found it, dropped it, picked it up, spent it, saved it, thrown it and held it tightly’. Now it is his. This book would suit students in upper primary and is a great way to make history more personal and engaging.